Back in the 1970s one of the first songs that I remember hearing on the radio was The House of the Rising Sun. That version was by The Animals who had a worldwide hit with it in 1964. Like other songs I remember from childhood it seemed like a very old song. It was a song that I remember frightened me, the adult tone of the lyrics and music stood out in my mind in the way that you don't understand at all as a child. As I grew older I realised what a great song it is but only recently did I realise that The House of the Rising Sun is an old traditional folk song, the original writer is not known. In 1962; two years before The Animals had a hit with their version, Nina Simone had recorded it as well. 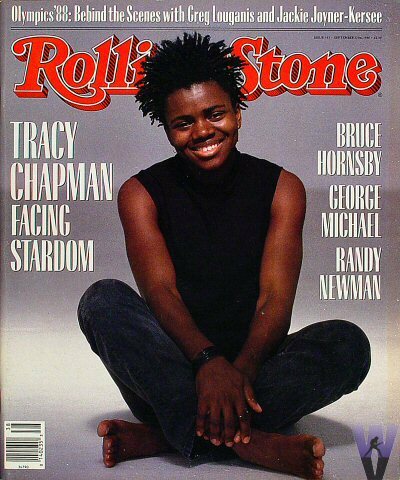 The House of the Rising Sun is one of the many fine songs that Nina Simone covered and brought to wider audiences but it is not her version that I am going to highlight but instead a version by Tracy Chapman. Back in the late 1980s Tracy Chapman was one of the first music artists that I saw in concert when she played the RDS in 1988 (I think!) with Hothouse Flowers and Deacon Blue. It was a brilliant concert. At the time she had released her debut album so everyone knew her songs and I can still see her up on stage in my mind. Tracy continues to be one of music's greatest singers, musicians and activists. Since the release of her self titled debut album in 1988 she had recorded a further seven studio albums. In 2008 she released her album Our Bright Future. Here is Tracy's cover of The House of the Rising Sun which she sang in concert in Milan in November 2008. It is just her and her guitar and the words and tone and mood of that amazing song.